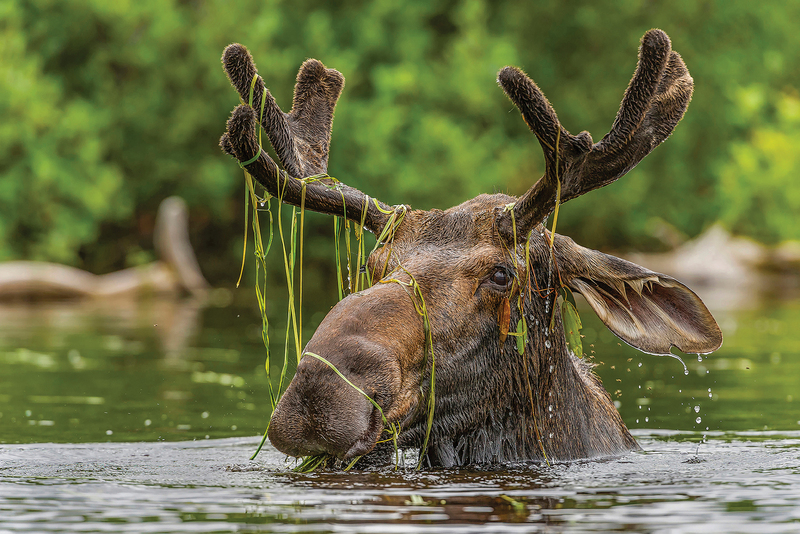 Another year, another crop of more than 2,600 amazing photos submitted to our annual photo contest. We’ve been hosting this contest four years now, and we’re still blown away by the talent and enthusiasm on display. 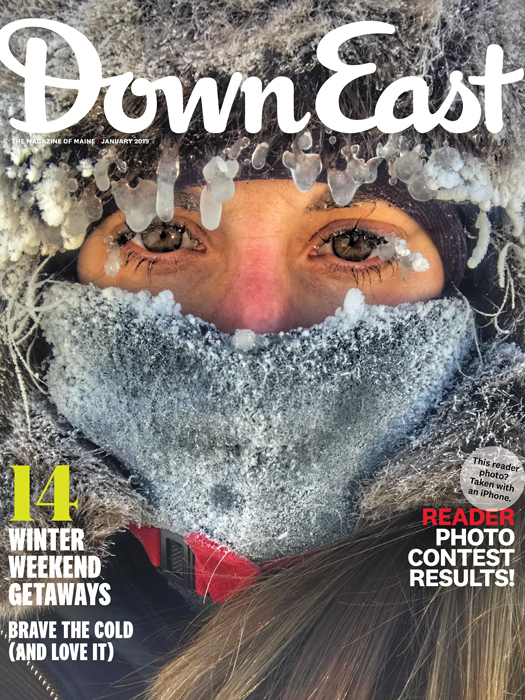 Down East readers know how to capture what makes this state great, and narrowing down the entries was no easy task. Thanks to everyone who submitted, and special thanks to Sebago Brewing Co. for sponsoring this year’s contest and choosing a special brewers’ pick. Some 400,000 (!) visitors have checked out our online gallery of contest submissions — see which shots they picked as the top 10. 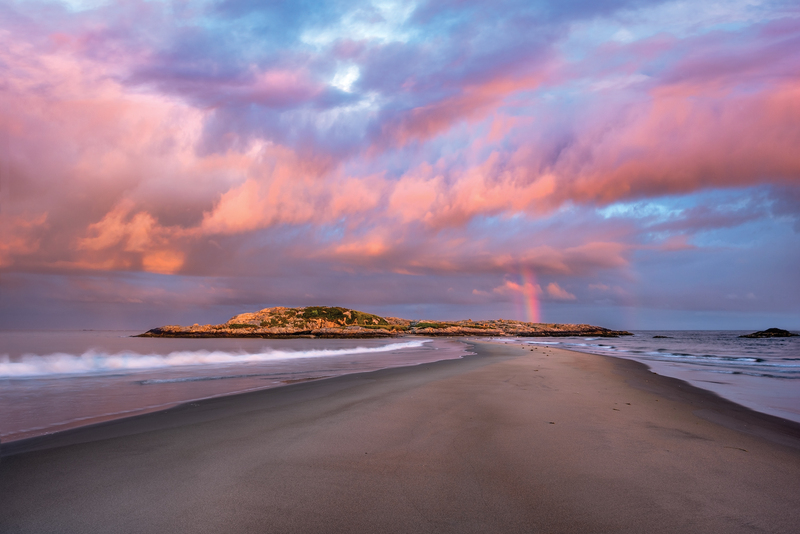 And to stay informed about next year’s contest — or just bring more stunning Maine photography to your inbox — subscribe to our email newsletters. 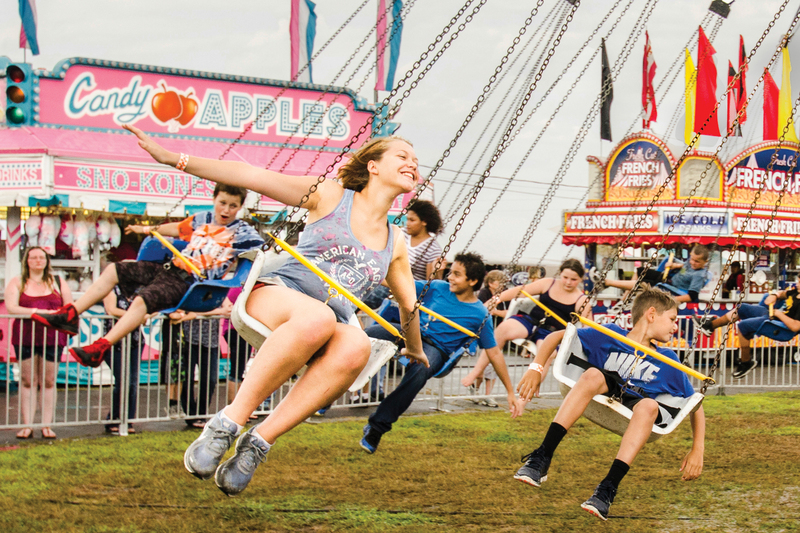 I love the Skowhegan State Fair for its festive, carnival atmosphere — and for the fried dough and the treasure trove of photo opportunities. These kids on the swing ride seemed to embody fun at the fair, and I was captivated by the girl’s unselfconscious expression of joy. Seeing her outstretched arms and broad smile gives me the feeling of flying and freedom. You might know the funky front facade of the triangular-ish H.H. Hay Building across from the Portland Museum of Art — that front window is my office, and I see many interesting things from that vantage point. 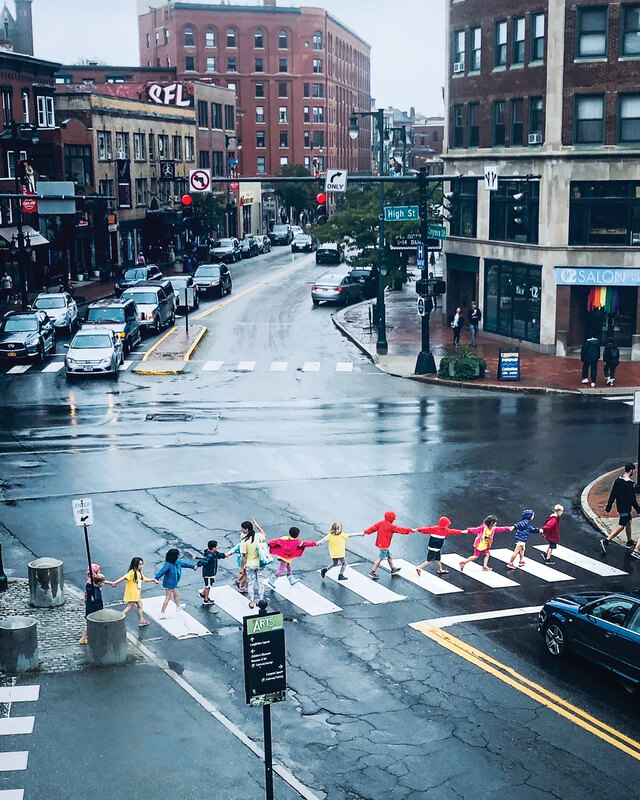 These kids, in their rainbow colors, were so joyful and playful on a dismal rainy day, taking care of each other under the careful supervision of their teacher. The moment was just so genuine and innocent. My youngest daughter and I went to a surf demo last fall held by Grain Surfboards. Until a few years ago, I’d always considered surfing a warmer-climate activity, but the surf scene in Maine is quite large and year-round. 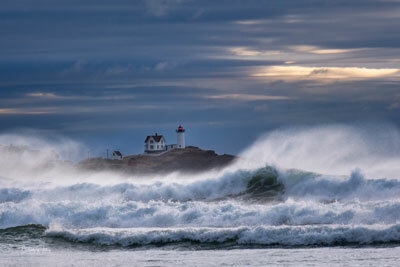 I used a super-telephoto lens and a low perspective to compress the scene and give the waves a larger-than-life feel. I just love the way the light comes through the waves. It was snowing hard when I noticed these fallen apple trees, and I actually drove back home to get my camera, hoping not to miss the storm. I’m often drawn to taking photos that evoke a feeling — maybe it’s loneliness, happy memories from growing up, or a sense of the surreal. 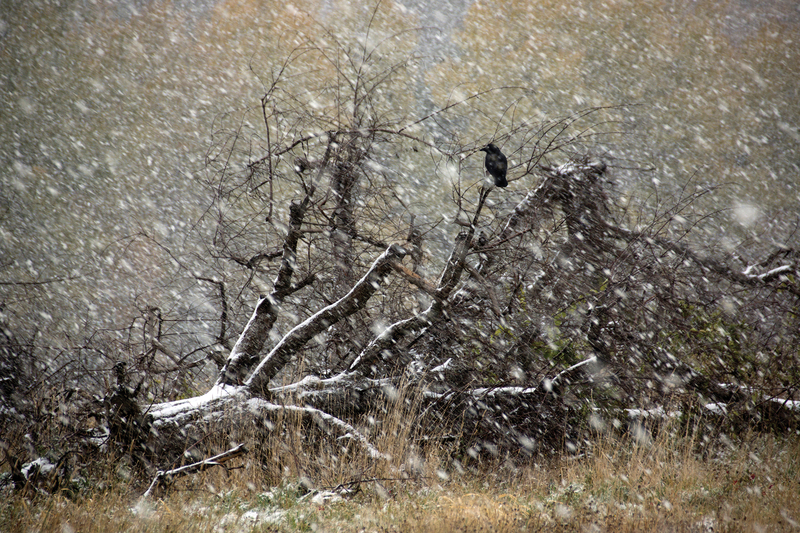 The crow here seems to have settled on the fingers of a hand, and to the right of the crow, the branches look like a running horse. To me, the scene has the feeling of a work from Poe or Hitchcock. Like a surfer, I chase waves, and for many years, I have captured them frozen in motion. This was shot in September after a heavy storm. 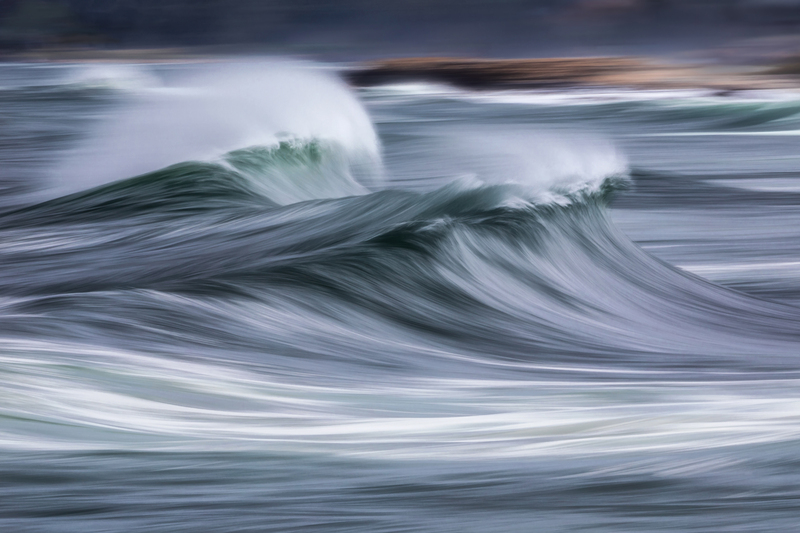 I’m always looking for ways to make images that are different, and I think I’ve captured a unique vision that represents the power and grace and infinite variety of the ocean that Maine is blessed with. Three friends and I went out to the beach during the tail end of a storm, hoping for incredible light. I was expecting lots of rain and some swimming, so I wore swim shorts, pink with yellow bananas all over them. My friends made fun of me, but then they learned these banana shorts were lucky. To get this shot, I waded out 100 or so feet in waist-deep water to a sandbar, then stood there through a few sideways downpours until the storm lifted. It was worth it! I was kayaking a winding outlet stream and spent about 45 minutes watching this young bull wading in a sharp-turn eddy. I sat in my kayak against old protruding stumps while he quietly fed in front of me. He was very secure with my presence. At times, he would completely submerge and when he came up, as you can see, he was rather decorated. I was lucky to get sharp shots on an even-light day with this cooperative fellow. 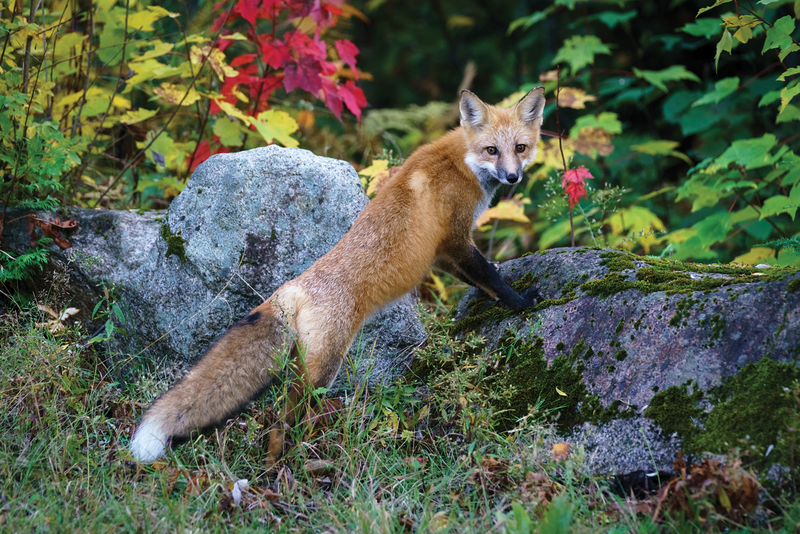 I was photographing the foliage near Baxter State Park this fall when I captured this image of a handsome red fox. He positioned himself perfectly on the rock wall, framed by the beautiful foliage. I’m particularly fond of how this image highlights the fox’s entire body, showing off his beautiful lines and colors. A friend and I went exploring the bays near my home to look for interesting birds and marine life. Gulls and other seabirds flock to this area in late summer to feed on prey pushed to the surface by tidal upwellings. 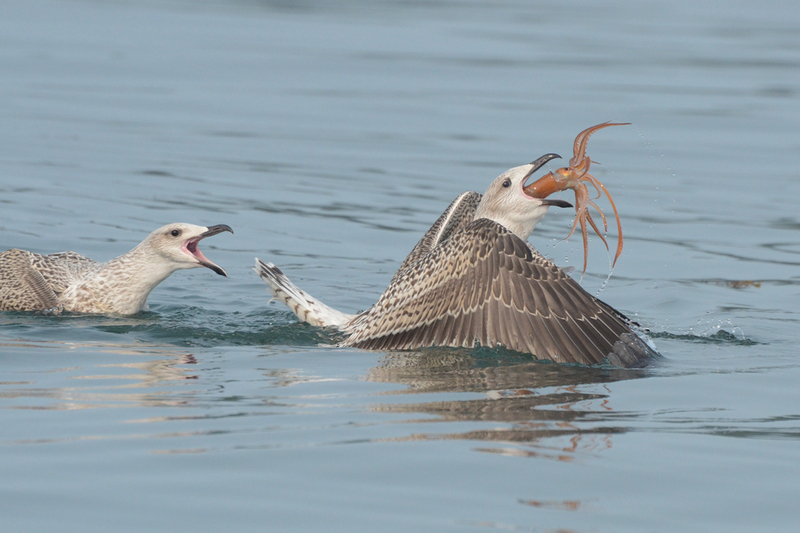 We found these two juvenile great black-backed gulls wrestling over a squid. I luckily snapped this shot as the victorious gull swallowed its prize. Russell Campbell, Stratham, New Hampshire. 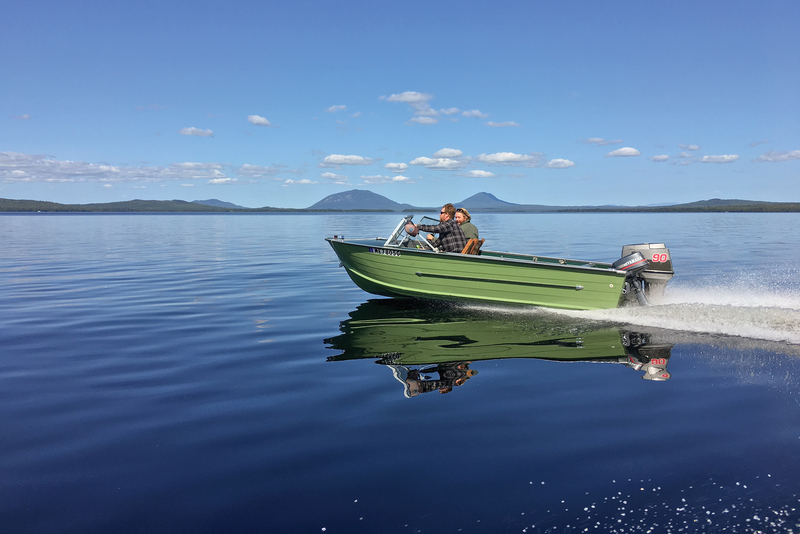 It was a perfect September day when I caught my wife’s cousin and a friend cruising by in a vintage boat. I love how clearly it captures the mountains in the background and the glass waters of Moosehead. The shot encompasses everything I love about Maine.